Sometimes I look down at myself and I can't believe this is me. The calendar says I'm 38, my aching joints and spreading hips say I'm 48, but I swear my brain says I'm 28. I hear this never reconciles. Speaking of my angsty 20s, I spent half a year living on a kibbutz in Israel. I was an idealistic vegetarian and believed the world should live on a commune (and that peace in the middle east was a real thing). Eventually, I had to come home and get a job (and thus my jaded 30s began). 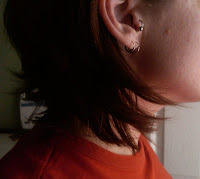 But my parting gift to myself was a tragus ring, carefully placed by a young Israeli in a Jerusalem tattoo parlor. I've had it for over 10 years and I love it. It's my personal reminder that I am capable of adventures, past and future. And this weekend I took it out. Not forever (I hope). The RE I saw last week referred me to a surgeon. The surgeon ordered a pelvic MRI. The MRI is today. I am a bit nervous. But I'm also a bit relieved. I definitely have chronic lower abdominal pain and I'd really like to know the cause. I'm hoping it's something simple and fixable (the fibroid) and that it's easily and quickly removed as we move forward on the path to IVF. I've never had an MRI before. I love small spaces (in that borderline-autism-spectrum-temple-grandin-hug-machine kind of way). But I *hate* loud noises. I know I'll be fine. Just jittery about the unknown. The surgeon is, apparently, very popular and her first available appointment to discuss the MRI results is November 1 (3 weeks from now!). I've been that patient and with a few pushy phone calls got myself on the cancellation list. Fingers crossed for a last minute appointment next week. I'd like to know what's happening and get this surgery under way as soon as possible. Who would have thought that kid who sold her beat up '82 honda civic hatchback for a plane ticket to Israel would be this infertile lady hoping for a chance at IVF (who, coincidentally, drives an '09 honda civic hybrid...I guess some things never change). I feel your pain. Exactly, because I'm 38, too. I refuse to believe that I am a middle-aged mom. But yeah, I think I might be. And can I tell you how much it does NOT help how young some of the blogging mamas are? Small spaces freak me out, but my wife loves them! I hope it's nice and cozy in there for you and that you get an answer that's easy to fix! My mom once told me she didn't feel any different between 16-40, and I totally understand that. I've only been 40 for a few months, but I will admit I definitely no longer feel like I'm in my 20's (mentally or physically). And I totally agree with Pom, all the young 'uns out there (in blogland and elsewhere) does not help! Hope the MRI was painless and the wait isn't too bad. I was pretty nervous aout my MRI, but they played nice jazz in the headphones and it was fine. I talked the tech into letting me keep one hand up on my chest (I had to promise I wouldn't move it), and I really think feeling that very slight pressure calmed me. I recommend asking. Also, in my recollection it wasn't THAT loud, at least not most of the time, mostly it sounded like being in an Atari space invaders game.